My husband and I share a birthday. Most years that means he comes home to no home-cooked meal and no cake. You'd think that after 10 years of marriage I'd forget just a little that it's my birthday too, and remember just a little bit more that it's his. I did a better this year, and when he came home from work at bedtime (his work schedule is odd) there was actually dinner, a cake, and a handmade card. Considering that I'm on the mend from a viral cold I was pretty darn proud of myself! Sad, I know. We've just never made much of our birthday (partially I think it's because February is so close to Christmas), but we need to work on that for next year. When I decided last minute to make him a card I of course dove right into my felt stash! This project is great for using some of those scraps. Because I had a limited time to complete the card the lettering is a bit crooked. I'll definitely remember to use a ruler the next time before it's too late! 1. Begin by cutting down the card stock to 5 x 7 inches or the desired size. 2. 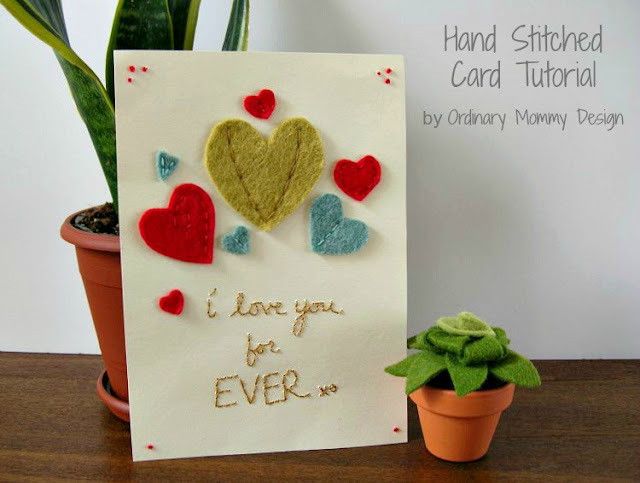 Cut heart shapes out of the felt scraps and arrange on the card in a pleasing pattern. 3. Remove all but the center heart from the card, carefully keeping them in the same pattern you want on the card (for reference). 4. Stitch the hearts one by one onto the card. Play around with your stitching style for some variety! NOTE: be careful not to bend or crease the card while you work. 5. Place a piece of wax paper over top of the card in the area where you want the lettering. Apply gentle pressure as you write the phrase you would like on the card. This will give you a guideline to follow. NOTE: now is a great time to grab the ruler. I noticed my lettering was crooked right away, but I was already committed. 6. 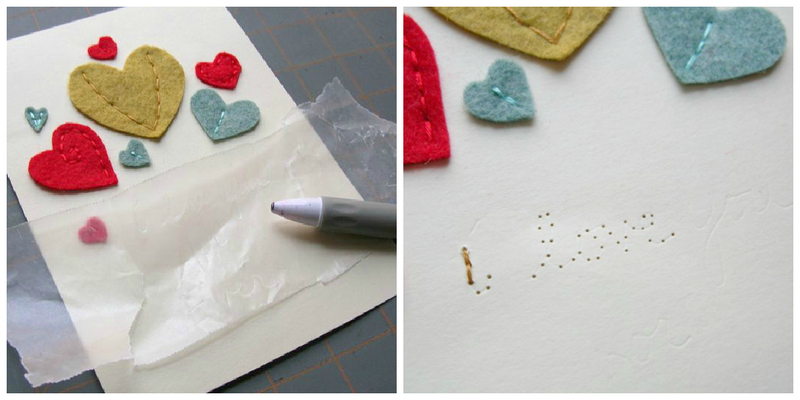 Use the needle to gently punch evenly-spaced holes along the lines of your letters. You'll want to do this since half of the time you'll be coming up through the back of the card, and once you punch that hole through the paper you can't un-punch it. 7. Follow the holes to stitch your message using 2 strands of embroidery floss. 8. Feel free to stitch a border around your card or just add a little something to the corners! Handmade cards are a great way to remind someone that you love them, encourage them to get well soon, or just because! To make this card more sturdy try gluing a piece of cardboard to the back or placing it in a display frame. It's so darling!! I am definitely going to try to find the time to make this for my hubby. Thanks for the tutorial, you're so creative!